Psychological comments: Can The Economist be trusted on intelligence? Thank you for that Dr T: most revealing. They are all honourable men, no doubt. I have spent more time than is sensible over the years trying to explain that tests where the bright bulbs all score more than 90% are no bloody use to an admissions tutor who has to distinguish the very bright from the superbright. The distinction would be hard to make with any reliability under the most favourable circumstances; under modern British conditions one is forced back onto semi-surreptitious entrance exams and questionable interviewing methods. That's "questionable" not in the sense of doubtful morality, but in the sense of doubtful effectiveness. My own solution has been to recommend more reliance on arbitrary rules and on games of chance. Specifically, I once suggested that if two candidates were tied in the contest for admission, we should choose as follows. (i) If they are both male, admit the younger. (ii) If both female, admit the prettier. (iii) If one of each, spin a coin. I don't think it makes any sense to adjust the data in any way at all, what we're interested in is the actual exam results (whilst acknowledging that even they are flawed, for the reasons given). What percentage of 16 year old children sit for the test and does this vary by race. I could not find this in the GCSE reports. 1. the harder the exam is, the wider the gaps are, and more authentic the rankings become. 2. much easier exam today not only narrows the gaps, but also sends false information on ranking most of the time. e.g. when the question is as easy as what is 21+3, almost everyone can get it right (gap narrowing), yet the best student could easily make a typo and end up as the 2nd or the last (flase info on ranking). We are witnessing the both effects these days. Easy exams in essence penalise the best while reward the mediocre. 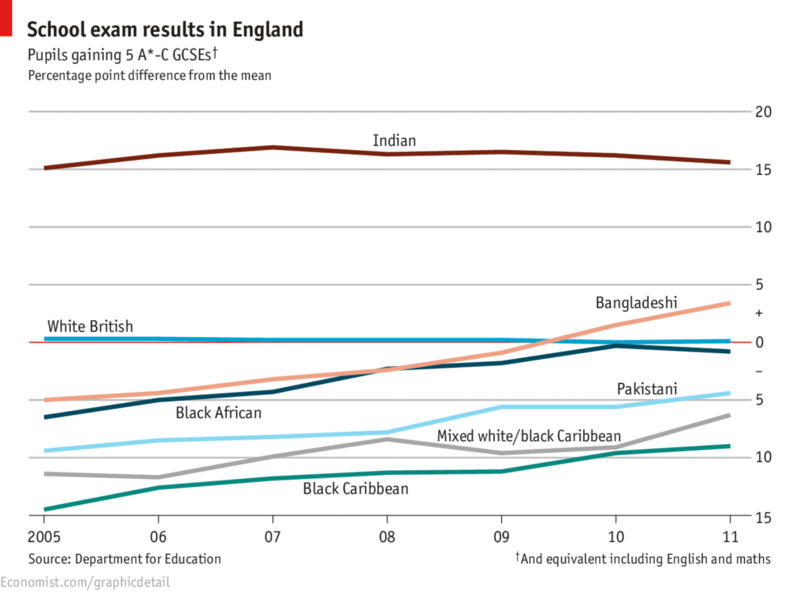 Indians' performance is no surprise under today's easy GCSE scheme. On average Indians study (due to cultural reason) much more than the Whites and other groups, the Chinese aside. Therefore, it is entirely possible for Indians to score better than the Whites for instance, even though they have much lower average IQ than the latter. To easily prove above explaination, one can select random samples from all these groups and give all an equivalent amount of time of training. Then take Chinese Gaokao exam or the equivalent ( by design they are very tough exams in order to rank 10s of millions of the Chinese students). The result of that is predictable with clear gaps: The Chinese on the top, the Whites as the 2nd, Indians 3rd... you bet. The Whites in Britain could have average IQ of high 90s nowadays instead of the default100 due to mass immigration from other parts of Europe. I promptly made above 2 comments following a google search leading me to here, without fully realising that this is a scholarly blog. So my apologies if I was rude by having made a mess above instead of several concise lines.